In 1997, the CIA devoted at least two exercises to exploring the national security implications of different endgame scenarios on the Korean Peninsula. The results of one of those exercises are reported in this January 1998 Intelligence Report. This is, however, a viewpoint that has been around for some time. 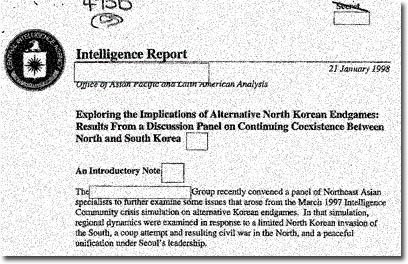 The 1997 CIA exercise described in the CIA document reproduced below is one striking example of this belief, apparently widespread during the 1990s, that the long term challenge facing the U.S. on the Korean Peninsula was not the North's pursuit of nuclear weapons (a challenge which in 1997 seemed to be under management as a result of the 1994 Framework Agreement), but the North's inevitable fall into economic and political chaos. As David Straub, a former senior Foreign Service officer with extensive experience in Japan and South Korea stressed at a recent Woodrow Wilson Center workshop on Korean security issues, wishful thinking is unfortunately a very common and widespread phenomenon among people and governments. (Note 6) Straub recounted experiences with American officials and experts coming to the U.S. embassy in Tokyo in the 1990s pontificating on their prognoses for the inevitable collapse of the North Korean regime, giving odds that allowed Pyongyang anywhere from a few months to perhaps two years before falling. While stressing that it was not and to his knowledge is not official U.S. policy, Straub suspected that there are some within the inner sanctums of the Bush administration who believe that with any luck, sanctions might be the straw that breaks the camel's back, bringing down the communist regime. Through the work of the National Security Archive Korea Project, documents are coming to light that reveal some of this history of concern and, as some would have it, wishful thinking regarding North Korea's staying power. The documents below provide a window into the views of administrations going back to Ronald Reagan, and the growing concern under the Clinton administration that famine and its attendant pressures on Pyongyang were weakening the ability of the North Korean government to retain control and power. (Note 7) As these documents make clear, particularly with respect to the Clinton administration, the threat was not seen as imminent, but still inevitable; the key unknowns were how long the decline would take, and what would be the straw that broke the North Korean camel's back. The pattern of growing concern is seen in the documents from the last half of the Clinton presidency. When Clinton met with Japanese Prime Minister Hashimoto in April 1996, the assessment given him was that despite the severe strains on North Korea's economic system, "we do not believe the regime's survival is under serious threat in the near term," a conclusion also reached in State Department talking points on the North Korean situation prepared that same spring. (Documents No. 5 and 6) By the end of 1996, the prognosis was growing more dire, with predictions of a bad harvest and reports that "Civilians are dying of starvation, and even many military troops are malnourished." (Document No. 9) A briefing provided to Secretary of State-designate Madeleine Albright in December 1996 warned that "the ongoing deterioration of the North Korean economy potentially threatens the stability of northeast Asia," but also stressed that, "Despite concerns about the sudden collapse of the DPRK, our ability to influence events there is limited…" (Document No. 11) By early 1997, the CIA was warning that the continued economic decline was confronting Pyongyang with eroding public support, growing hardship for the political and military elite, and the threat that efforts to reform the economy could unleash forces potentially destabilizing to the communist regime. (Document No. 12) The remaining years of the Clinton presidency saw this dilemma growing deeper for North Korea, as State Department intelligence reports warned of a possible "Countdown to Starvation" (Document No. 15) and noted increased flows of refugees seeking to cross into China, with the potential for destabilizing the border area between the two countries and increasing Beijing's concern over the future course of developments. For Clinton State Department officials, Kim Jong Il and his advisers faced a daunting challenge: "To successfully recover and rebuild from a devastating decade of decline, North Korea's leaders must make gut-wrenching decisions" regarding how wide-ranging and fast to pursue economic reform and government transparency, with the choice apparently reduced to one between an inevitable fall into economic and political chaos, or the prospect of destabilizing change. (Document No. 19) Given this choice, and Kim Jong Il's fierce determination to hold to power, many saw the North's fall as inevitable, if not imminent. If Kim Jong Il's hold on power is as tenuous as some would believe, then sanctions may be viewed as the diplomatic equivalent of controlled demolition, or as some would put it, regime change. Did "wishful thinking" about North Korea influence the Bush administration's refusal to engage in direct talks with Pyongyang, while similar assessments of the North Korean regime's stability prompted South Korea's and China's efforts to moderate harsh U.S. positions? No doubt, these perceptions of North Korea's sinking fortunes, and by implication Kim Jong Il's motivations and objectives in pursuing nuclear weapons, have affected and continue to color U.S. and allied strategies and tactics for responding to Pyongyang's nuclear ambitions. This INR memorandum locates North Korea's economic ills in its "ideological straightjacket of self-reliance for 40 years," and notes the start of debates over new policies and approaches to invigorate the economy. This CIA assessment seeks to get inside Kim Il Sung's head to illuminate the rationale behind Pyongyang's return to a hard line stance towards the IAEA and the West, noting that North Korea "continues to behave in ways that are counterproductive to its desperate need for Western economic assistance." Striking a theme that will recur throughout the 1990s, the CIA concluded that "the North had to choose between pushing forward with fundamental changes or reversing course." This INR brief notes further recurring themes in the ongoing assessment of North Korea's economic woes: the important role China plays in providing aid to Pyongyang, and Beijing's desire to keep the North Korean regime "afloat" out of self-interest to prevent an influx of refugees across the border. This INR assessment, though only partially released, begins the process of following Kim Jong Il's efforts to secure his place as Kim Il Sung's successor, with the worsening food crisis presenting a serious challenge that could put the North Korean leader in a "political bind." This memorandum, prepared for Clinton's meeting with Japanese Prime Minister Hashimoto, again emphasizes the balancing act Pyongyang is attempting to carry out, seeking to address the growing economic problems without endangering the political survival of Kim Il Sung's fledgling leadership. These talking points, apparently prepared for trilateral consultations with Japan and South Korea, outline the points of agreement regarding the situation in North Korea: the nation was in a steep decline, but not facing a serious threat of collapse; the role this crisis is playing in pushing Pyongyang to seek aid talks with the outside word, and the assessment that, despite the deepening food crisis, Kim Jong Il is succeeding in maintaining political and social control. This INR report adds new graphic detail to the assessment of North Korea's downward economic spiral, writing of "large numbers of people foraging for wild roots and grasses," as "Border regions are being deforested and some factories dismantled to barter lumber and scrap for Chinese flour." North Koreans are described as feeling their situation is "the worse since the days of extreme privation during the Korean War." This memorandum, while providing additional details on the food emergency confronting Pyongyang, lays out the rationale for providing food aid to North Korea in terms of the broader policy goals. Believing that the DPRK was "deeply appreciative" of the earlier U.S. humanitarian aid in February 1996, Lord links this appreciation to North Korea's participation in a first round of missile talks and agreement on Korean War remains. Lord argues that further unconditional humanitarian aid could encourage more progress on bilateral U.S.-DPRK issues and work to elicit a positive response from North Korea to the Four Party Peace Proposal. This memorandum, apparently prepared in the fall of 1996 for another round of trilateral talks with Japan and South Korea, updates the food crisis in North Korea and the continuing need for humanitarian aid. The U.S. position is that it had no current plans to offer additional aid to North Korea, seeking to reconfirm the consensus that South Korea should take the lead on any major food assistance, but remaining open to reviewing new international appeals for help on the merits, an assessment that had to take into account the political ramifications of any decision to help or not help Pyongyang. This assessment from late 1996 again draws the conclusion that the severe food shortage is not causing any serious political problems for the North Korean regime, as the populace continues to view this crisis as but one more remnant of long-standing imperialist designs upon North Korea. In a refrain of the argument put forth by Winston Lord in his memorandum to Secretary Christopher earlier in the year (see Document No. 8 above), the memorandum does link the economic crisis to Pyongyang's "unprecedented" appeal for international aid, as well as steps taken to encourage private barter trade both domestically and with China. This briefing memorandum, prepared for Secretary of State-designate Madeleine Albright, again puts the issue of the U.S. response to North Korea's economic dilemmas within the broader context of American policy objectives for the Korean peninsula. The bottom line is stated clearly and unequivocally: "As the North Korean economy has deteriorated, we and the ROK have also cooperated to prevent the precipitate collapse of the DPRK, since it would present unacceptable military risks and economic costs." As the second Clinton administration began, the CIA laid out the key elements of the North Korean policy issues confronting the government. The challenge is clear: "North Korea will remain a serious challenge to regional stability as long as the Stalinist regime endures - and we cannot yet predict its downfall." In what must have been a now frustrating observation, the analysis notes that the ongoing economic deterioration is sapping the stability of Kim Jong Il's regime, yet somehow he remained firmly in control. Still, perhaps for some a ray of hope (or fear) could be seen in the observation that the deprivation was finally beginning to affect the elites and eroding (though by how much and to what effect is not said) popular faith in the regime. As the economic crisis deepened, the State Department INR and Office of Korean Affairs convened a roundtable of experts to discuss the crisis, its potential impact on regime stability and broader U.S. policy interests. Echoing earlier assessments, the panel found that the food crisis was real, though uncertainty remained as to its scope and potential for actual famine in North Korea. The experts also agreed that aid alone would not solve the crisis, which required addressing deep structural problems, a step that carried its own risks for Pyongyang. While no one held that the communist regime was facing imminent collapse, most felt its long-term prospects were dim if current trends continued. Despite these uncertainties, the panel reconfirmed the judgment that U.S. support of humanitarian aid to North Korea was in line with other U.S. policy goals on the peninsula, including preventing the outbreak of war, creating a stable peace, promoting change in Pyongyang and reducing the nuclear threat. In 1997, the CIA devoted at least two exercises to exploring the national security implications of different endgame scenarios on the Korean Peninsula. A March 1997 panel examined the implications of three scenarios: a limited North Korean invasion of the South, a coup attempt and ensuing civil war in the North, and peaceful unification under South Korea's leadership. This exercise concluded that from Seoul's perspective, the optimum endgame would be gradual reconciliation leading to eventual reunification on South Korean terms, without unacceptable economic costs. To further investigate this scenario, a second roundtable of experts was convened in late 1997 to examine the potential for reconciliation as well as the implications of a prolonged period of competitive coexistence between the two Koreas. The results of that roundtable, reported in this partially declassified CIA report, stressed that the fundamental variable is "the question of time" - would North Korea be able to survive long enough for peaceful reunification to occur, or was the regime more likely to collapse due to its endemic economic problems? While rehearsing the familiar observations about Kim Jong Il's ability to stay in command, the report notes the common view held by South Korea and other regional powers that for the time being, the continued existence of North Korea is preferable to the unpredictable costs of reunification in the near term, either peaceful or otherwise. The odds against the regime's continued survival were low, however, as the majority of the experts doubted the regime could persist beyond five years - i.e., 2002 - given the unwillingness or inability of Pyongyang to pursue fundamental reforms. This INR report notes that the North Korean government had warned that the country's grain stocks would be depleted by mid-March, leading the World Food Program to state that immediate aid was needed to avoid "potential starvation." The document is interesting for the light it sheds on how difficult it was (and is) to accurately determine the extend of North Korea's food crisis, noting the range of estimates emerging from other nations and international organizations. It is also interesting for its conjecture that Pyongyang may have made its declaration in part to sound out the new South Korean government of Kim Dae Jung. This brief note comments on observations of recent Western visitors to North Korea that the people seem "reasonably well-fed" and in overall better physical shape than last year, according to reports from the U.S. Embassy in Seoul. Despite these reports, international organizations continued to forecast a persistent and deepening food crisis. As 1998 neared its end, the reports from North Korea continued to present a mixed picture, combining inadequate grain harvests, widespread malnutrition and stunted growth for large percentages of North Korean children. Pyongyang is trying to promote more agricultural production, using reforms similar to those adopted in China. Given that the regime's priority was keeping the capital supplied with food, observations of conditions in Pyongyang likely did not represent the situation throughout the nation. This INR brief notes that despite recent reports that the food situation had stabilized somewhat in North Korea, China still had to deal with a "wandering population" of largely rural residents seeking to cross the border into China in search of better conditions. Apparently, the growing numbers of such refugees was leading Beijing to adopt more aggressive steps to locate and forcibly repatriate these illegal immigrants, with even more harsh steps possible if the Chinese leadership decided the situation on the border is becoming destabilized. As the Clinton administration was drawing to a close, there was some movement towards more productive engagement with Pyongyang, as seen in Secretary of State Albright's trip to North Korea in October and Kim Jong Il's proposed, but aborted, visit to Washington, D.C. These signs of movement were still shadowed by the North's continued economic ills, as seen in this memorandum to Secretary Albright (and read by her, as seen in the 'MKA" stamp) forwarding an INR assessment of the North Korean economy. As the cover memorandum to Albright stressed, North Korea faced "gut-wrenching" decisions if it was to stem and reverse the slide into economic collapse. The INR assessment, which roots the collapse of North Korea's heavy industry in its dependence on Russia and East Europe for economic aid, fuel, inputs and markets, lays out two basic tasks necessary for economic reform in the nation: increased transparency about the nation's economic situation, including officials more knowledgeable about Western values and practices, and so more open to cooperation with Western international economic organizations, and an urgent program to rebuild human capital, which had been so depleted by famine, disease and inadequate education. 2. See Rice's comments reported under "Five Governments, One Crazy Guy, " in Al Kamen, "Diplomacy Turns a Profit," The Washington Post, October 25, 2006, p. A15. 3. See Donald Gregg and Don Oberdorfer, "Wrong Path on Korea," The Washington Post, September 6, 2006, p. A15. 4. For a very good discussion of the diplomatic challenge facing the imposition of effective sanctions, particularly from the viewpoint of Chinese and South Korean participation, see the briefing by CSIS experts on October 11 2006. 5. Robert D. Kaplan, "When North Korea Falls," The Atlantic Monthly (October 2006), 64-73. 6. Click here for a webcast of this conference, including David Straub's comments. 7. During the Wilson Center workshop, it was noted that some believe that the assumption North Korea was on its last legs were a factor in assessing the 1994 Framework Agreement, making concerns about Pyongyang's commitment to carrying out its obligations under the agreement largely moot.